Exercise for recovering breast cancer patients can often produce painful lymphedema symptoms. As a consequence many patients avoid exercise; this leads to weakness, frailty, more pain, swelling, lower energy levels, weaker bones, increased likelihood of injury, and a shorter lifespan. Fortunately with a protocol of slow, progressive weight lifting one can increase strength and reduce painful lymphedema symptoms. “In the last decade, Linda Miller, the director of the Breast Cancer Physical Therapy Center in Philadelphia, has found that patients who strengthen their arms controlled their lymphedema symptoms better than those who didn't lift weights. "For years, I was spitting in the wind," said Ms. Miller, a physical therapist. "This study is going to rock the lymphedema world." “The physical function study involved 295 survivors of breast cancer that had not spread (metastasized). Half the women took part in slowly progressive weight lifting twice a week. After 1 year, half as many women in the weight lifting group lost physical function as did women in the control group… More specifically, 12 out of 148 women in the weight lifting group, or 8.1%, lost physical function, compared with 24 out of 147 women in the control group, or 16.3%. At our Austin Strength Training facility we have had success working with recovering cancer patients. The recovery systems of these patients have already been strained. They cannot stand long bouts of exercise. Our personal training sessions are short and designed to efficiently stimulate a change; we then give them plenty of time to recover. The equipment we use is MedX medical rehab equipment which is more easily tolerated by the joints. We can restrict the range of motion to a pain-free range of motion, and we use controlled movements, i.e. slower, to minimize forces that could aggravate pre-existing conditions. Lance Armstrong once said. “Before I just lived now I live strong”. The catch 22 is doing this without aggravating pre-existing conditions. As the studies listed above have demostrated, it can be done. Years ago I had a woman come in who had been given the green light to exercise after suffering from cancer. I told her we would start slowly and that eventually the workouts would be hard. She told me, “John, I survived cancer. I can do your workout.” Boy was she right. She got dramatically stronger in no time. A client such as her, who starts from a weakened state, will have more upside potential for improvement. A few years later she developed cancer again and survived. It was of great help to face this second challenge with a stronger body. I had another cancer-surviving client inform me that he believes the reason he survived his cancer is because he was strong. When suffering illness our recovery abilities are channeled to overcome that illness. Similarly, when we exercise our recovery abilities are used to rebuild tissue after the stress of exercise. One can easily exceed those recovery abilities. It is best not to do too much exercise. How much exercise is enough? You should start from the premise of not how much exercise you can withstand but what's the least amount that will produce positive results. That way you will be less likely to exceed your body's ability to recover. Those who have had operations to excise the cancer need to avoid jarring movements that will stress the compromised connective tissue. Many exercises are jarring - running, jumping, and thrashing about. It is best to find a type of exercise that minimized that jarring. At New Orleans Personal Trainers and Austin Personal Trainers we use smooth controlled movement that minimize the ballistic forces that can cause injuries. We also will use medical rehab equipment that can be used by those in a delicate condition and also by those in great shape. The weights can be varied as little as two pound increments, and the weight stacks go up to 1000 pounds. The range of motion can be adjusted to as little as just a few degrees depending on the limitations of the client. Regardless of your physical state we can help you safely find out just how much exercise you need to produce positive change. “But a study at the University of Minnesota that was released this week contradicts decades of restrictions. It found that slow, progressive weight training did not increase the onset of lymphedema in breast cancer survivors who had had lymph nodes removed, nor did it worsen the symptoms of longtime sufferers. Slow, progressive weight training is the preferred protocol at Austin Personal Training and New Orleans Fitness trainers. By minimized the acceleration with slow smooth movements we minimize the forces that cause injury. The muscles are safely fatigued. This fatigue is what signals the body to become stronger. The protocol is performed on MedX medical rehab equipment. The protocol and the equipment have allowed us the effectively work with many people with a wide range of conditions. We can help you set up a program that will produce positive change regardless of your condition. What Clients Are Saying - "My years of strength training helped me survive cancer"
Number eleven in a series about what clients have to say about their workouts. I recently visited New Orleans a place I had lived for many years. I had the good fortune to cross paths with an old friend, Gunnar. He was once a long time client. I did not recognize him at first as he had lost his full head of air as a result of cancer treatment. He is 76 and healthy now and has yet to retire. He told me his years of strength training helped him survive his bout with cancer. I don’t know how much of an impact strength training played in this instance. I do know that as we age we get a little weaker and lose a little muscle each year, and that decline begins to accelerate as we get into our 60s. In his later years Gunnar was not getting weaker; he was getting stronger. He was strength training. A person with a stronger body can better withstand ailments one will inevitably confront. Strength training reverses more of the bio-markers of aging that any other form of exercise. You need not spend hours in the gym to make a profound difference. Studies have shown that significant strength increases result from high intensity training as little as once a week. As you become stronger you will find you will be able to engage in more activities, and this will further enhance your health. It all starts with strength. Just improve a little each week and over time you will feel years younger and your life will be transformed. High intensity training is the type of personal training we do at Austin Fitness Training and at New Orleans Fitness Trainers. At Austin TX Personal Trainers and at New Orleans Fitness Trainers we have had success working with recovering cancer patients. The recovery systems of these patients are fragile. They cannot stand long bouts of exercise. Our personal training sessions are short and designed to efficiently stimulate a change; we then give them plenty of time to recover. I worked with one client through two bouts of cancer. When she first came in I told her we would build up slowly, but eventually she would be asked to do very demanding work. She replied, “If I can handle chemo I can handle this workout”. She handled it well, and became very strong. I think the fact she was strong helped her when she faced down cancer a second time. As Lance Armstrong once said, “Before I just lived now I live strong”. Some women living with lymphedema have managed to do repetitive upper-body exercise in a way that doesn't aggravate their symptoms. In the last decade, Linda Miller, the director of the Breast Cancer Physical Therapy Center in Philadelphia, has found that patients who strengthen their arms controlled their lymphedema symptoms better than those who didn't lift weights. "For years, I was spitting in the wind," said Ms. Miller, a physical therapist. "This study is going to rock the lymphedema world." The ordeal left Ms. Warren, 55, so devastated that she stopped lifting even the lightest weights. Her weakened upper body eventually became a problem. "Because I lost muscle tone," she said, "I kept hurting my arm." She now practices slow, progressive weight lifting, but she laments not being advised to do so earlier. 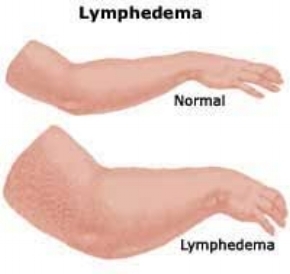 If she had, Ms. Warren said, she might have avoided lymphedema or at least better managed her symptoms. At Kelly Personal Training in Austin and at Ultimate Fitness in New Orleans we have had success working with recovering cancer patients. The recovery systems of these patients are fragile. They cannot stand long bouts of exercise. Our personal training sessions are short and designed to efficiently stimulate a change; we then give them plenty of time to recover. Lance Armstrong once said. “Before I just lived now I live strong”. The catch 22 is doing it without aggravating pre-existing conditions. As NYT article reports; it can be done.